The Arroyo Seco stream, a major tributary of the Los Angeles River, was once home to a thriving run of steelhead, those fantastic anadromous fish that begin their life as trout in coastal watersheds and then proceed to the ocean where they spend most of their life as steelhead. They then attempt to the return to their stream of origin to spawn a new generation and die. The Southern Steelhead (Oncorhynchus mykiss irideus) is a federally listed endangered species, and there is an adopted steelhead recovery program to restore the species. After the construction of Devil's Gate Dam in 1920, steelhead could no longer reach the cold waters of the upper mountain watershed of the Arroyo Seco to spawn, and the subsequent concretization of the Arroyo Seco stream and the Los Angeles River made return basically impossible. There has been a lot of focus on the Los Angeles River lately with the US Army Corps of Engineers announcing a billion dollar plan to restore it. Sometimes fish and steelhead in particular get mentioned. The Arroyo Seco is the first stream on the LA River system where steelhead can be reestablished because of its historic steelhead run and because it is the first major stream on that river to reach up to the mountains and the cold water and habitat the steelhead need for spawning. 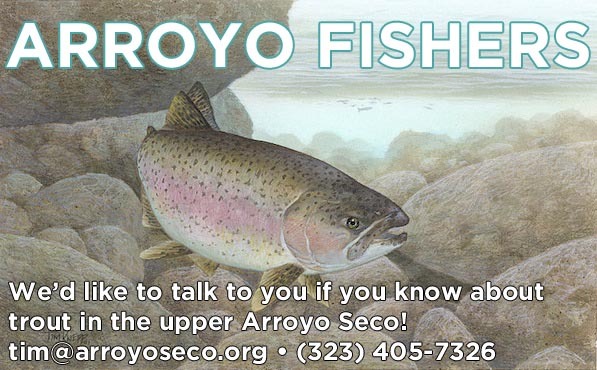 The Arroyo Seco Foundation believes there are still native Rainbow Trout in the mountain watershed of the Arroyo Seco. Despite the adverse circumstances downstream, the trout have continued to reproduce in the mountains. During flood periods, they might even be able to escape to the Pacific, but any who are transformed into steelhead are not able to return to the Arroyo Seco steam at this time. We would like to document the presence of native Rainbow Trout in the Arroyo Seco. For many decades the CA Dept of Fish and Game stocked trout from other mountains in the Arroyo stream, so establishing the genetics of the native fish is particularly important. It will build a good case for improving stream and habitat conditions in the Arroyo Seco and could conceivably eventually lead to the restoration of a steelhead run on the Los Angeles River again. We would like to enlist some enthusiastic anglers to scout the upper reaches of the Arroyo Seco stream in the San Gabriel Mountains to find native trout there. A trained scout would then take a fin sample for genetic testing. The upper stream is accessible from trails off of Angeles Crest Highway. ASF can provide in formation about likely sites and proper procedures. This will be a very signifcant and exciting project for fishers to participate in. Please contact Tim Brick at tim@arroyoseco.org or (323) 405-7326 to get involved. 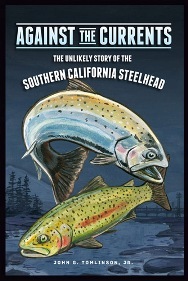 The fascinating story of steelhead in the Arroyo Seco is featured in a new book, "Against the Currents," published by the Aquarium of the Pacific in Long Beach. John G. Tomlinson, Jr., tells the story of Charles Holder of Valley Hunt Club fame and his depictions of this spectacular fish and how it used to frolic in the Arroyo Seco stream. Steelhead begin their lives as rainbow trout in the mountain watershed and then migrate to the ocean where they make the physical transformation into steelhead. Later they would return to their stream of origin to spawn and die. The Aquarium of the Pacific has also installed a permanent exhibit on the steelhead in Southern California as part of their watershed exhibit. There are still native rainbow trout in the mountain watershed of the Arroyo Seco. During flood events some of them reach the Pacific Ocean, but will they ever be able to return to spawn? The Arroyo Seco, as Holder and Tomlinson document, is the most likely stream to restore steelhead in the Los Angeles River system.